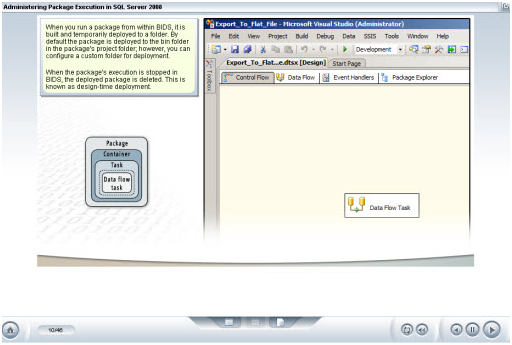 SQL Server 2008 makes business intelligence (BI) available to everyone through deep integration with Microsoft Office 2007 family, providing the right tool, to the right user, at the right price. Employees at all levels of an organization can see and help to influence the performance of the business by working with tools that are both easy to use and powerful. With the Database Engine at its core, SQL 2008 offers integration, reporting, and analysis tools to access and process the data necessary to create business solutions. This course gives an overview of the importance of business intelligence in today's competitive market and introduces the capabilities provided by the Server's Integration Services, Reporting Services, and Analysis Services. It then focuses on the use of SQL Integration Services as a data integration solution and outlines the installation and configuration of this server component. The course also covers the key utilities used to configure and manage Integration Services, including the Server Management Studio, Business Intelligence Development Studio, configuration wizards, and command-line tools. This course covers the objectives for the Microsoft exam: 70-448 T'S: Microsoft SQL Server 2008, Business Intelligence Development and Maintenance. Passing this exam will earn the learner Microsoft Certified Technology Specialist (MCTS): SQL Server 2008, Business Intelligence Development and Maintenance certification.